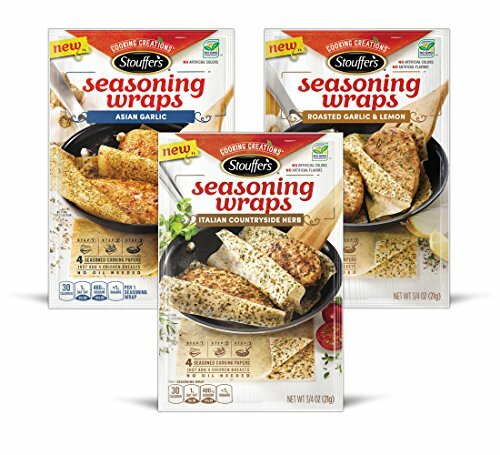 Stouffer’s Seasoning Wraps take traditional heat-safe parchment paper (commonly used in baking) to a whole new level. Our sheets are coated with real herbs and spices and help to expertly season, brown, and lock in juices and flavors all at once. These herbs and spices infuse flavor into your chicken while releasing a delicious aroma into your home. The products contain no artificial colors and have no GMO ingredients. As an added benefit, there is no need to add oil. The Seasoning Wraps keep skillets clean which minimizes clean up after cooking. If you have any questions about this product by Stouffer's, contact us by completing and submitting the form below. If you are looking for a specif part number, please include it with your message.